The Black Lined Plated Lizard is a long slender species which has in the past been confused as a Yellow Throated Plated Lizard due to a similar appearance. What does a Black Lined Plated Lizard look like? This is a long, slender species that reaches a maximum size of 45cm, however 25-35cm is average. The tail makes up about 70% of the total length. The body scales are hard and keeled giving them a rough texture. The body is usually brown above with two yellow and black dorsal stripes that run from just behind the ear all the way down to the tip of the tail. The flanks (side of body) is often speckled with red, the underside is cream to blue-grey. 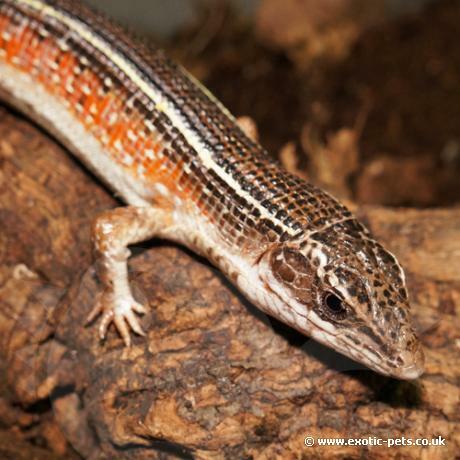 This species has been known as Yellow Throated Plated Lizards for many years, however Exotic Pets has taken the time to correctly identify this species. The main key identifications are the amount of supraocular scales (scales above the eyes), the texture of the feet and their overall scale texture. Where are Black Lined Plated Lizard from? This species is widespread in Tanzania, south-east Kenya and eastern Rwanda, living in moist and dry savanna, grasslands and costal bush areas. They are often found near holes which may be rodent burrows or termite hills; this is a quick escape if startled. How do you keep Black Lined Plated Lizards? Provide Black Lined Plated Lizards with a spacious enclosure; a 48x24x24 inch vivarium will easily house a sexed trio (1 male, 2 females). As this species can be found in a range of habitats, substrate and décor is really down to preference. We use a soil and orchid bark mix, however the clay burrowing substrates would be ideal as this species naturally lives in and around burrows. Provide areas to climb and decorate with live or artificial plants. Use a minimum 5% UVB light, placing a reflector will help direct the UVB rays down onto your lizards. Provide a basking area of 27-29C (80.5-84F), this can be dropped down to 20-22C (68-71.5F) for 3-4mths of the year. Night time temperature should be lowered to around 16-18C (61-64.5F). We would recommend lightly misting your enclosure for approximately 2mths prior to dropping the daytime temperatures. This may simulate the Black Lined Plated Lizards wet season which in turn could start them breeding. All other months keep this species dry. Feeding is easy with this species, they will take a number of insects including, crickets, locusts, wax worms and they have been known to eat snails. Dust foods with a vitamin supplement twice a week, all other feeds can have calcium added. Provide fresh water and change if soiled, we have noticed this species doesn’t spend much time in or around the water area.